So its all been quiet for a long time now. I have been very busy working on new and exciting parts of my life including re-training and setting up a business now I am a qualified personal trainer. Because my business is not taking up a large part of my time, I am using the blog on my business site for keeping people up to date. Please let me know what you think of my updates. Back in November last year it was pointed out to me that I qualified for the ETU Long distance championships with my Bolton IM result. I paid the £10 to pre-register for it in Feb time and had then decided not to bother paying for the race and doing it as it didn’t really bother me to do the GB AG-er thing. After my IM race in Austria was such a disaster I decided I didn’t want to wait until next year have another go at putting together a decent IM race so with not many weeks notice, I decided to give this a go. The journey to Almere was very exciting having never done the Ferry thing before! Got to say, it is the best way to travel by far in my book if are are within 2-4 hours of a port – I will be doing this more often, so much more relaxed than the packing and travel for a flight. Amazing! Started front row and commenced with the usual ‘punchup’ in the first 15mins resulting in having a fat lip and swollen face for the rest of the rest. A rather fetching purple chin on sunday morning as a result. Went a little off course and too wide at times as sighting was quite difficult as very overcast and not very light at 7am but kept very smooth all way around, I think what I lost in time from not drafting I gained back from having lots of open water with no battling or trying to dodge to move around people. T1 – uneventful, took time to put a jersey on over my trisuit as having had a cold all week, didn’t want to get pneumonia on the bike as its wasn’t very warm in the morning. Amazing again! The bike course at Almere is so pan flat the only ‘hills’ are a couple of bridges over roads. Quite a lot of sharp narrow turns on cycle paths mean you have to literally stop to corner a lot of the time as marshals chaperone you around in single file. Once out of Almere you hit the coast road and its around 70mins head down along a straight flat road with no turns – sounds fast?? Well take into account the incredibly strong head winds and its like cycling in a wind tunnel – far from fast! Many comments from people saying ‘give me hills over this any day’. It was pretty brutal – personally not my favourite type of course as there wasn’t much scenery on the long coast road so quite boring. That said, the second lap seemed easier as by then you knew how long that Headwind section was so you knew to just get your head down and grind into if for an hour or so. Back and shoulders were killing afterwards which I assume is from being literately in one position for 6hrs – because its so flat you don’t move around on the bike so much apart from the short part of each lap on cycle paths with the tight corners. Very long story as to why I pulled out but suffice to say since my appalling day in Austria several health issues have reared their head and i’m being treated for 2 of them and still under investigations for another. Having been on antibiotics for the last week and also having a head cold all week its almost it a miracle I made it to the start line so getting a huge PB on my swim and having a very strong bike leg, I should really walk away from this race with some feeling of achievement. Next year, I will be a whole lot healthier and stronger. I don’t want to sound like i’m simply making excuses, at the end of the day I pulled out – no two ways about it. Only I know how ‘I’ felt and only I know ‘MY’ reasons behind the decision, and at the end of the day it was MY race. I know there will be plenty of ‘HTFU’ comments, but sometimes the true way to ‘Man up’ is to admit defeat in a single race, knowing it is for the best in the long term. 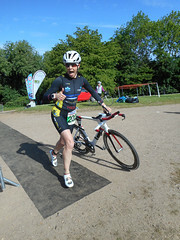 Annoyingly – if i had got around a 4:10’ish marathon I would have got bronze medal for AG as my swim and bike had been strong. Oh well, there will be many more races to come. Disappointed but not defeated – bring on 2015, MY DAY WILL COME! Ponteland is quite local to my family home so decided to do this so my Mam could come see me race a short course – bit more interesting to watch than her getting drowned in Bolton for god knows how many hours last year at IMUK. 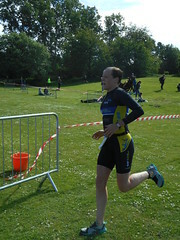 Unfortunately – she did get soaked again as it was torrential rain until the run – again, rain seems to follow me on races! The race is for a local charity for a guy called Simon Bates who was training to do an IM but died before he did his first triathlon. 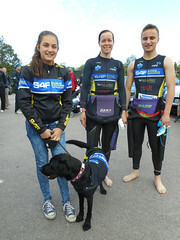 The really touching thing is, all his family and friends were racing, his mum and dad even did a relay with his sister, his mum looked so determined in the swim bless her everyone was cheering for her to keep going. It was very emotional even for people like me that never knew Simon. Really mixed turn out – i counted around 20 MTBS being racked and then about 40-50 bling bling TT bikes, then a mix of everything in between. The pool swim had 6 people to a lane and it seems many people didn’t estimate their swim times very well as when i was swimming there a guy who was so fast he lapped me twice, and a guy who i lapped twice who was doing breast stroke – and then other speeds in between! The bike course was on open roads with several cross roads and T-junctions so a couple of times had to come to a full stop. The run, was 90% on grass (verges on side of main road) and due to the torrential rain all night and morning this was just a mud bath for me and the later runners who didn’t set of until around 11am – trust me to try my Zoots out on this day…..
1:12 – PB by 4 mins.